Let’s face it. Photographs make pages pop. I took a photography class in high school, but now that I have a blog I realize I want to be able to use my camera to it’s fullest. 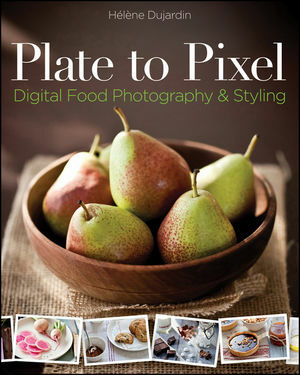 I was so happy when Wiley Publishing asked if I wanted to review Plate to Pixel: Digital Food Photography and Styling. This is a fantastic book. Not only does it show you how to arrange food better so it looks great. The book also explains how to properly use natural and artificial lighting and so many other things. This is really important if you really want great photos. Don’t worry they start with the basics so no matter what level photographer you are you can learn . Hopefully y’all will see a big difference in the photographs that I take. Chapter Two: Camera Settings and Modes. Chapter Four: Artificial Light Photography. Chapter Six: Setting Up for Capture. Tips and techniques for making food look good—before it tastes good!Food photography is on the rise, with the millions of food bloggers around the word as well as foodies who document their meals or small business owners who are interested in cutting costs by styling and photographing their own menu items, and this book should serve as your first course in food photography. Discover how the food stylist exercises unique techniques to make the food look attractive in the finished product. You’ll get a taste of the visual know-how that is required to translate the perceptions of taste, aroma, and appeal into a stunning, lavish finished photograph. So, have the cheese say, “Cheese!” with this invaluable resource on appetizing food photography. Author Bio: Hélène Dujardin is a professional food photographer and stylist. Her images grace the pages of numerous cookbooks and magazines, and as a former chef she also prepares the majority of the dishes she photographs. Her blog, Tartelette, has earned high praise in the food blog community.